Size: Margin Guidelines are 5.5" wide by 9.5" tall. I think this is Adrienne's fourth official scroll assignment. 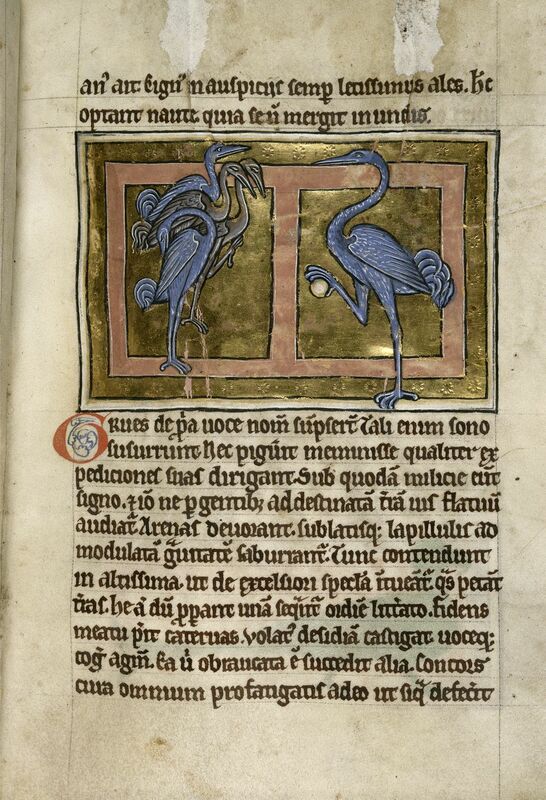 She learned from Leon's father that he really loved cranes, and found this page from a period Bestiary to use as inspiration for both the design and the words. Leon's brothers both also received their Tyger's Cub awards at this same event, and the other scribes used the same source as inspiration. Each brother was compared to the virtues of a different animal that was their favorite. 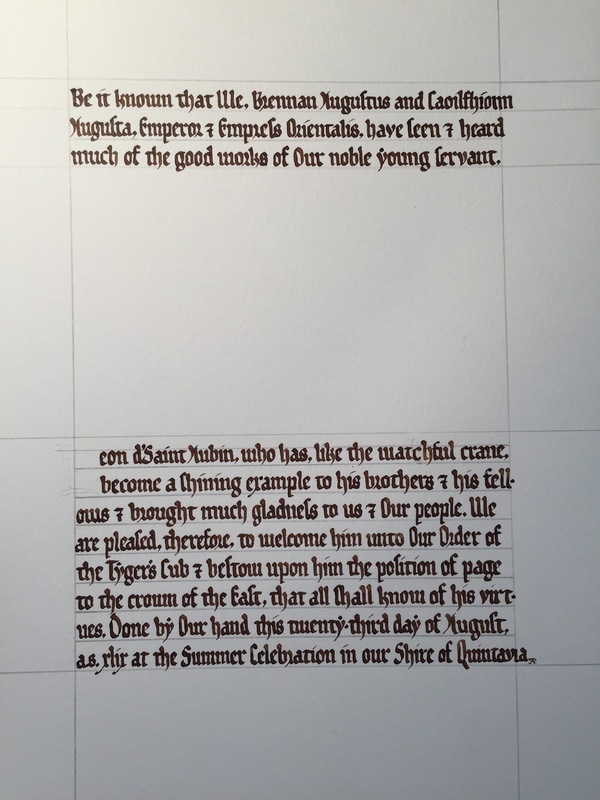 Fitting the words for this scroll was an interesting challenge. Adrienne wrote them and sketched rough outlines of the cranes and tyger's cub to determine their size. It was up to me to fit the text around these elements. We wanted to keep the finished artwork area 9.5" tall so it would hopefully fit in a standard mat & frame. My practice page for the hand, figuring out the right size for the text and line spacing. The numbers on the right are me trying to figure out the vertical space I have to work with. Take a close look at finished calligraphy below. 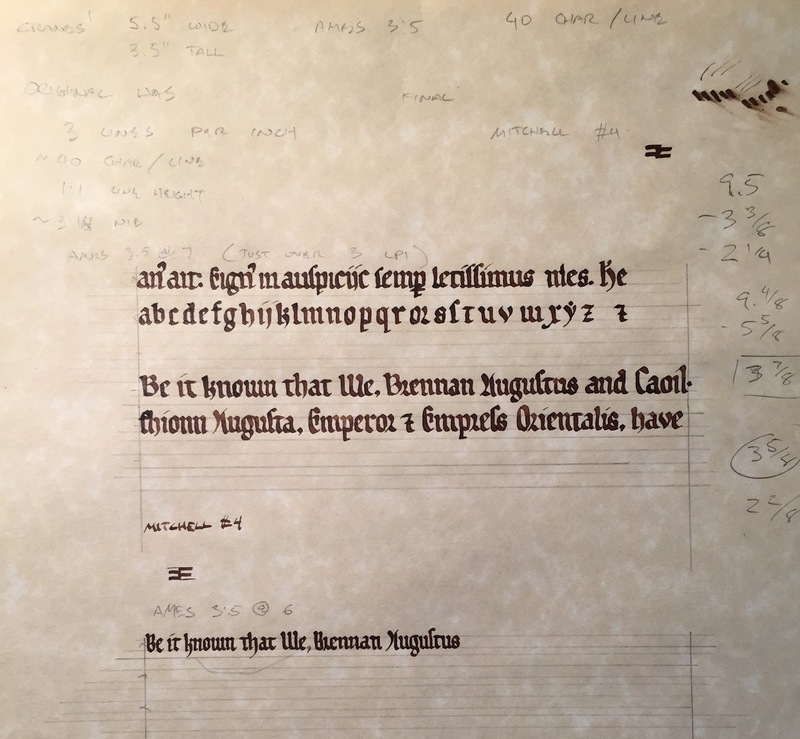 Compare it to the final scroll image. Notice any differences? This was my first attempt. I finished it, and then discovered I had measured the space for the crane image incorrectly - it was too small! Adrienne couldn't adjust her now finished sketch, so I started over. Happily, I like the second version better as I was able to get the text to fit within the margins better. Lesson learned: triple check my measurements! I had a lot of fun with this hand. Proto Gothic is used to describe the hands during the time where Carolingian Minuscule was slowly morphing into Gothic. You can see the narrowing and beginning of the angular letter forms of Gothic, but there is still a softness to the letter shapes. Using a very flexible Mitchell nib was critical to this piece, as it allowed me to create the wide club serifs at the top of the ascenders through a little extra pressure. First attempt at the calligraphy. Adrienne's illumination on this scroll came out really really well. I believe someone asked us when we were handing it off prior to Court if it was for a peerage. 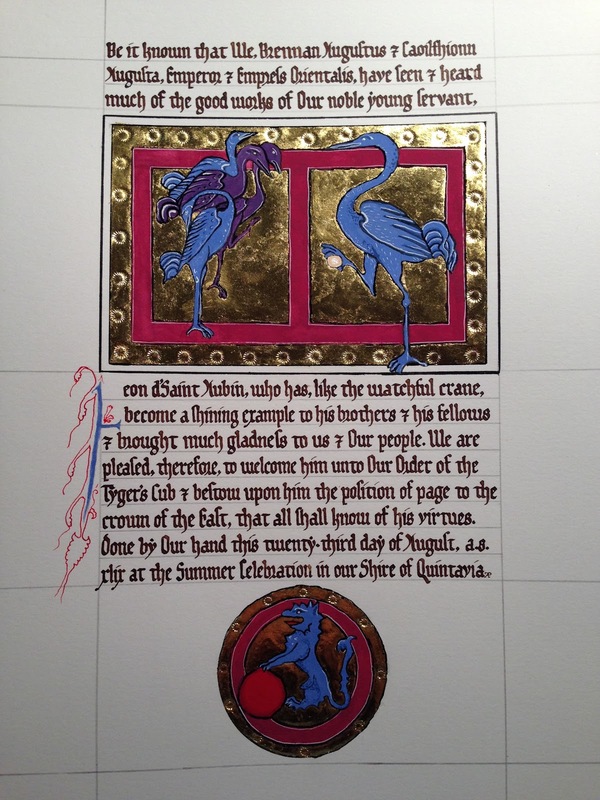 Details of Adrienne's cranes; lots of very shiny gold, and the tooled gold border. The tooling was accomplished with a decorative leather punch and hammer after the gold leaf was done. The Tyger's Cub badge, modified by Adrienne to match the style of the cranes.